She placed the hummingbird in my hand and he just laid there like he was dead. But he wasn’t. I could feel his itty bitty chest pulsating rapid little taps on my palm. I was afraid I’d crush him, so I tried stretching my hand as flat as possible. It was time for him to go, but he wasn’t moving. He was so small and light it was like holding a whisper. I looked closer at his little body of tiny feathers that looked like a million colorful eyelashes. Without moving his head, his eye moved to look right at me. Was he scared? Did he need help? No. He needed to catch his breath and then the little hummingbird launched with an awkward flutter of his wings and then darted into the sky, high up as fast as he could zip like a bottle rocket. 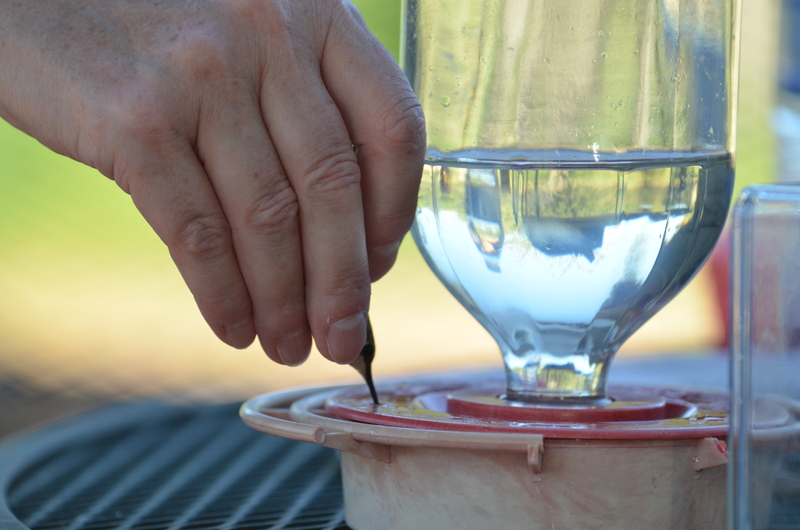 Catching a hummingbird isn’t exactly easy. 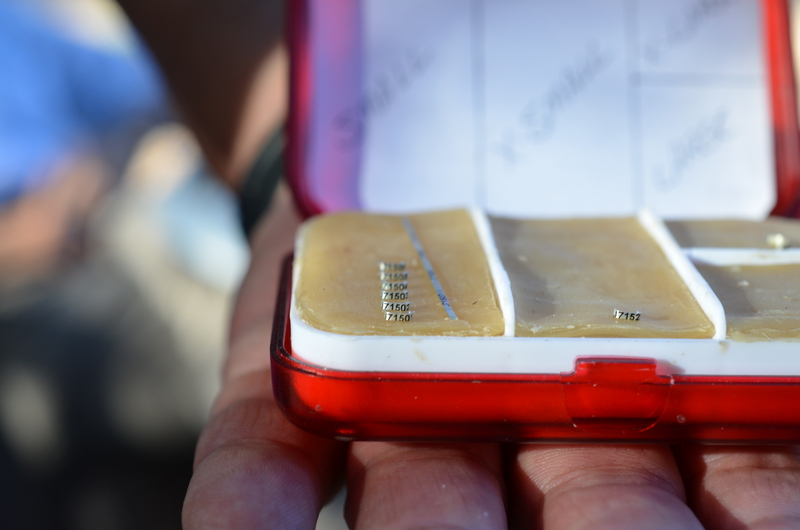 It takes a feeder, a carefully engineered bonnet trap, a remote control radio system and a dedicated group of volunteers who bring their passion and commitment every week to help study these birds. It also takes a special federal permit to do hummingbird banding since native birds are protected by the Migratory Bird Treaty Act. In other words, don’t do this yourself. You need to be a trained person holding a permit to do this. 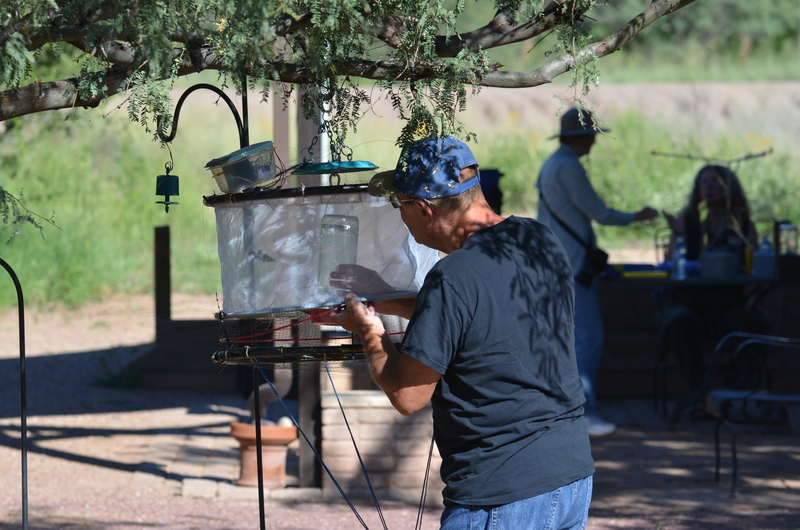 A volunteer takes a hummingbird from the trap. 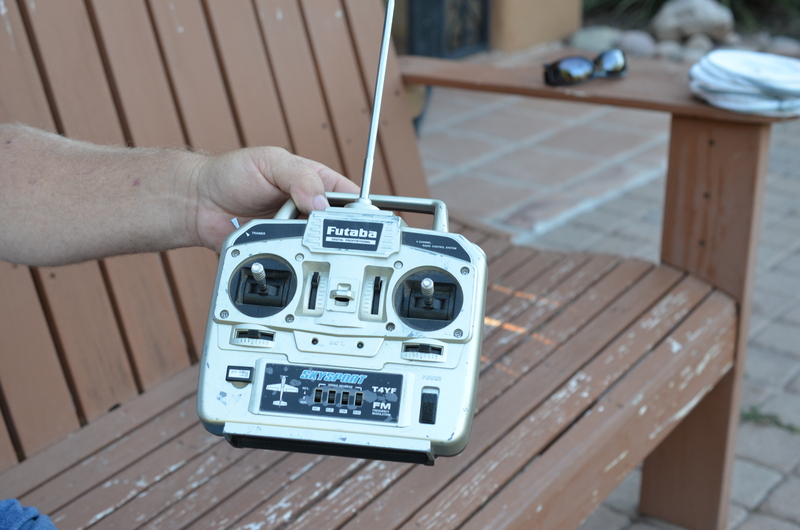 The remote control that operates the trap. SABO was founded by Naturalist/Directors and husband-wife team Tom Wood and Sheri Williamson. Sheri is well-known around the world as the expert ornithologist on hummingbirds and is the author of A Field Guide to Hummingbirds of North America in the Peterson Field Guide Series. Sheri ‘s unassuming, warm personality puts you instantly at ease and you have to be reminded that she’s highly sought out by bird experts and ornithologists for her deep understanding of hummingbirds with her pop-up banding lab in the middle of the southeastern Arizona desert. She and Tom live in nearby Bisbee, a little town that feels a little bit like a hippie haven, and seems to fit their laid-back personalities. 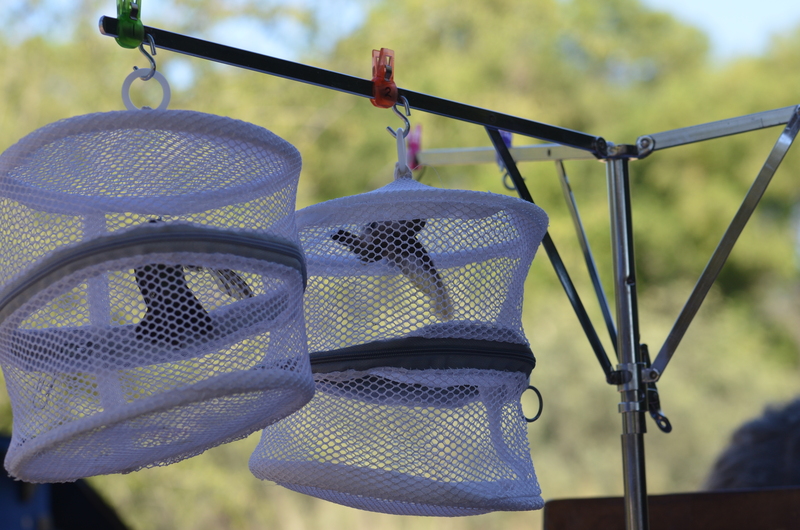 The hummingbird queue for weighing and measuring. To call the bands “little” is a gross understatement. 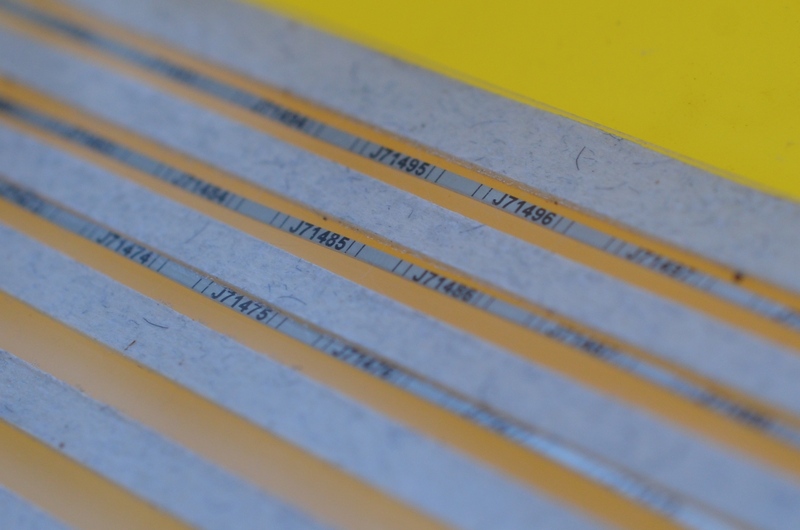 They are tiny bands of aluminum with numbers imprinted on them. They come to SABO from the American Ornithological Union (AOU) not as bands, but as strips, which Sheri and her team have to cut up then make into tiny loops channeling the skilled craftsman of a jeweler. The teeny tiny bands and numbers. Small, medium, large and extra large bands, relative to hummingbirds, of course. Bands aren’t one-size-fits-all. They have bands ready for the smallest hummingbird (the Calliope Hummingbird at 2 3/4″ in length) to the largest (the Blue-throated Hummingbird at 5 1/4″ in length) that fly through the San Pedro River conservation area. It’s this area that makes it attractive for banding and studying as it shows the importance of a river as a critical migratory corridor. “One of the biggest challenges in migratory birds is the need for a stopover to fatten up and refuel,” Tom reminds me. 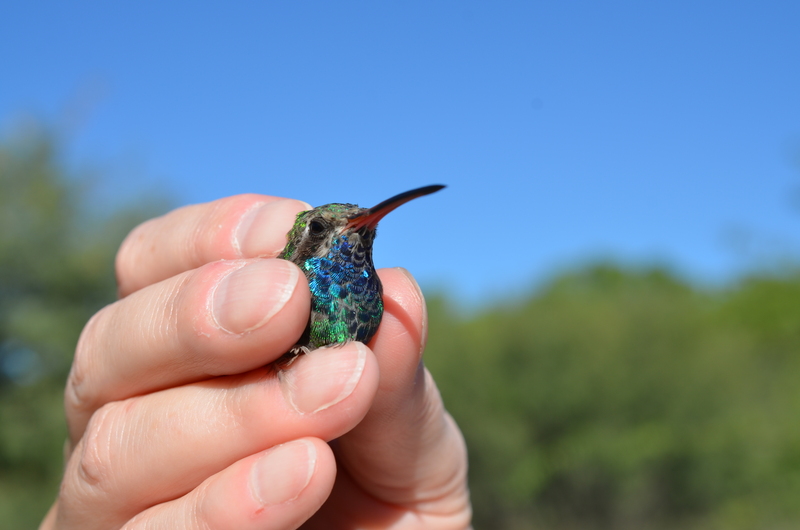 SABO bands and records data on over 500 hummingbirds in a year. This enables the tracking of migration schedules and reproductive cycles, and lets us know how long birds can live. The more we can learn and know about birds the more we understand about the state of our environment and where things are in balance and where they’re off balance. Birds aren’t here just for our amusement and enjoyment, but they’re part of our planet’s delicate ecosystem. Just think food chain. No birds? Well, then be prepared to be up to your eyeballs in insects and resulting diseases. 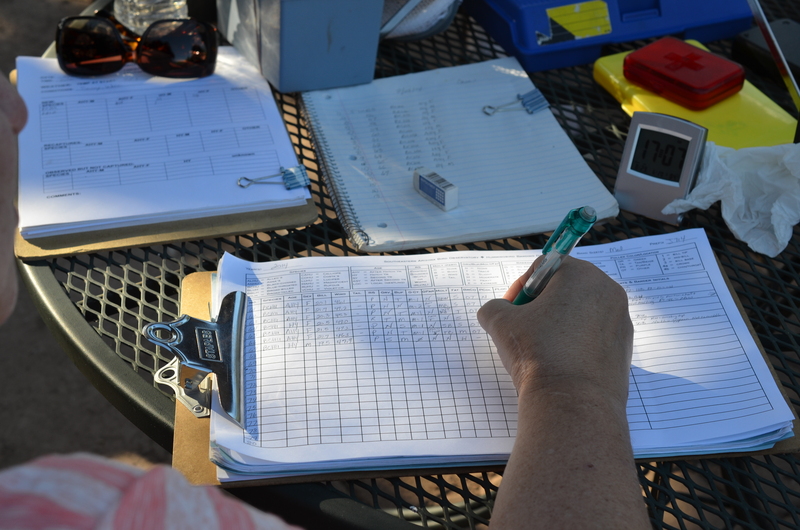 A volunteer records for Sheri. This card shows the data for a female black-chinned hummingbird that has been recaptured two times after its original banding. 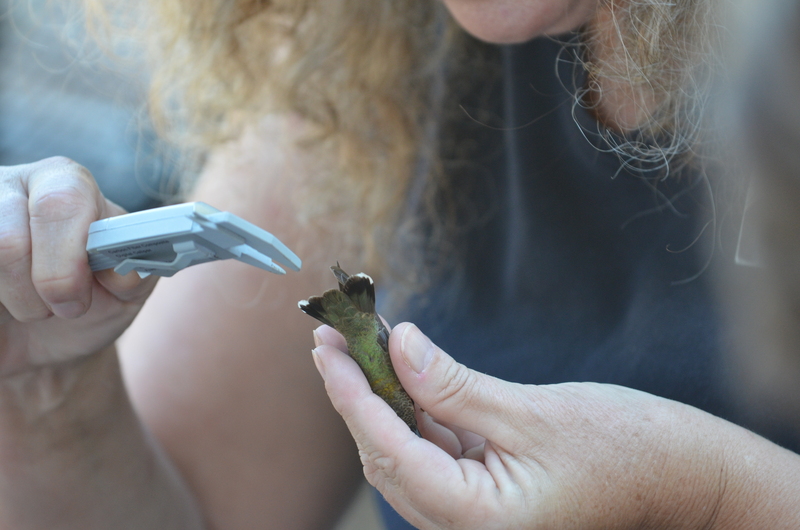 As Sheri inspects each hummingbird I marvel at two things: Sheri’s nurturing sense about her examination (“Oh, you’re a little one,” she coos) and that, with the exception of one that managed to escape, each bird remains still throughout the measuring, weighing and banding. “Oh, I just love hummingbirds. They’re so cute,” I say stupidly and ashamed that I couldn’t have chosen more sophisticated words around such knowledgeable people. Sheri chuckles and then says, “Hummingbirds are the gateway drug to birding,” I nod my head in agreement. She then grabs a straw and puts it in her mouth and begins to blow lightly on the underside of a hummingbird and I see that her breath opens up the feathers, revealing a light, pink tummy. “What does that tell you?” I ask as I lean in to get a closer look. With the straw still in her mouth she tells me that it shows her how much fat it has. 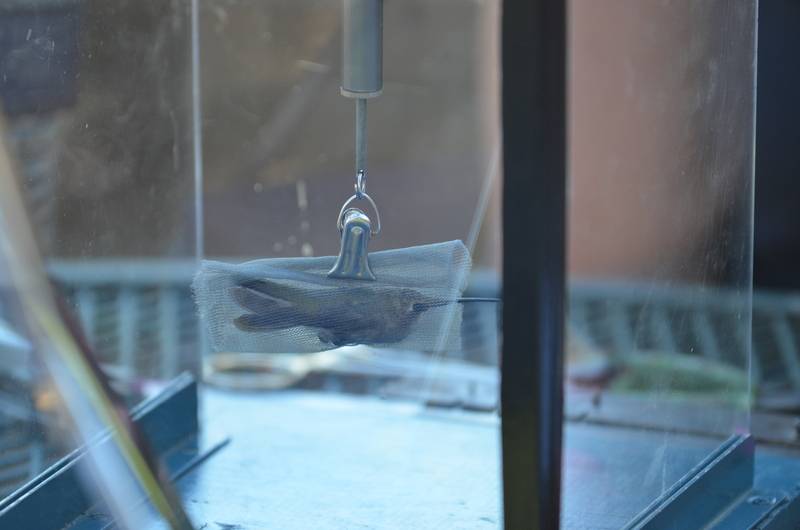 This is how you weigh a hummingbird. Checking for fat. “Sonic Burger has the best straws,” Sheri tells me. Fueling up after the weighing and measuring. 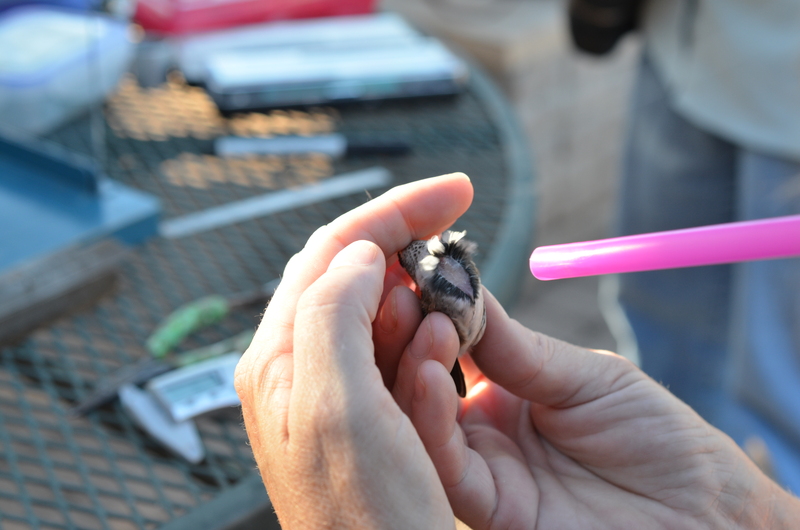 Volunteer holds a Broad-billed Hummingbird freshly banded and ready for release. After each little hummer has had its drink, she places the bird in my hand and we go through this pattern of waiting as the bird contemplates, I imagine, if it’s now safe to take off. Some fly off after about 15 seconds and others need to muster up the courage to dart up into the blue sky. We repeat this process with several birds, with my husband and I each taking turns. Catching his breath and getting ready to go. Note the new tiny band on his leg. It’s during the precious little moment when the hummingbird is still that you realize someone has flipped a switch and turned everything off. He’s not flitting around or buzzing near your ear like George Jetson. He’s quiet. He’s still. The frenetic pace of the world that often matches the 80-times-per-second wingbeats of the hummingbird have come to a screaching halt. Time has stopped and I wait for that moment for the little bird to signal that it’s ready, that it’s time to flip the switch back on. When I returned home, I showed my friend and her 11-year-old daughter my photos from this trip. The young girl’s face lit up when I showed the close up of the tiny bird in my hand. “Mom, I want to hold a hummingbird!” she pleaded. Yes, we should all want to hold hummingbirds. Great article! 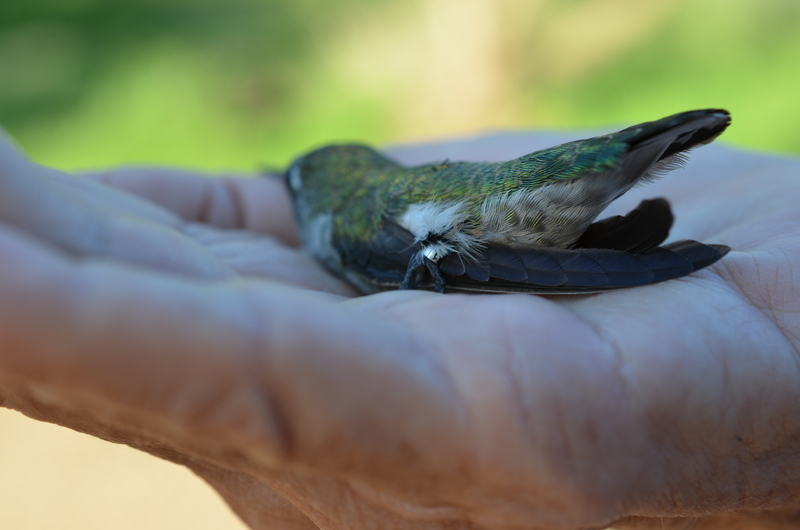 We’ll be at Casa San Pedro in Arizoba at the end of this month to see the Hummingbird Banding! I hope I get to hold a hummingbird too! Oh you are so lucky! You will love Casa de San Pedro. We picked up steaks at the Tucson Costco, which was right near the airport and we grilled steaks on the BBQ at the B&B. I’ll be writing a post about the B&B as well, so look for that. This sounds like an awesome place! BTW, I recently wrote to you to check out Dauphin Island, Alabama. A great local event coming up is the Alabama Coastal Birdfest, a 3-day weekend (Sep 30 – Oct 3) of various birding and nature trips. 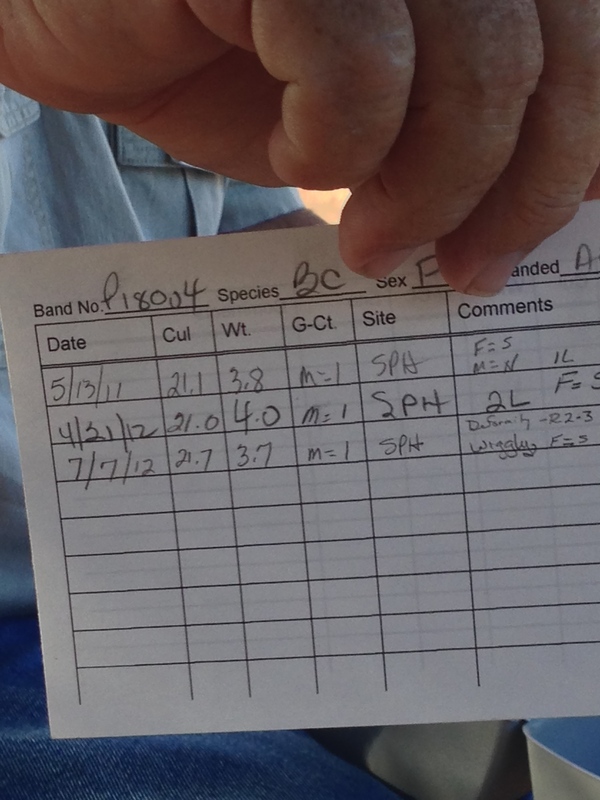 Bird banding used to be an event until the gentleman who headed up the group passed away last year. Several other great trips are still available, including to Dauphin Island for fall migration. I hope you and your readers will check it out! You can Google for the website and see the schedule. Hi Angie! I mentioned to my husband the other day your recommendation to check out Dauphin Island. Not certain we can make it this year, because of another commitment, but we definitely will have to put it on our short list for next year. I’m going to check out the website RIGHT NOW. Thanks again! I really enjoyed this post. Thanks for all the details and photos! We did this for the first time last year. The kids loved it! Of course, I did too. ‘Gateway drug’ is right. Fantastic piece…thanks for sharing!